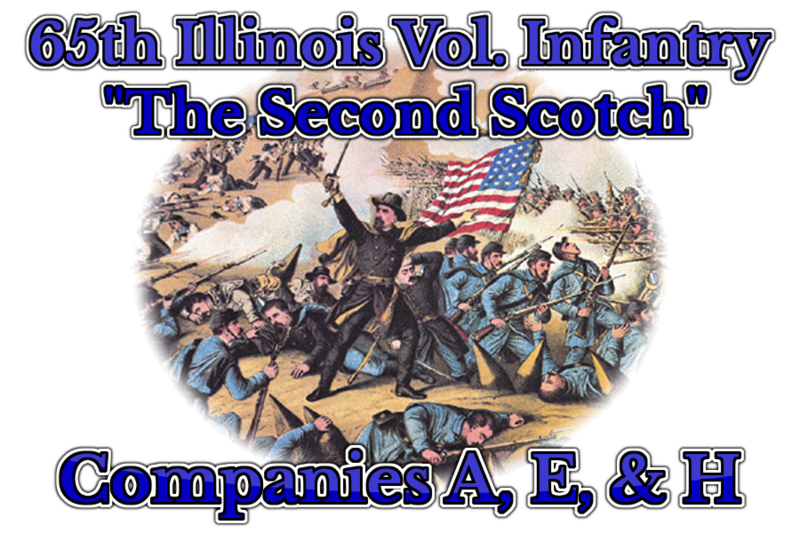 The Sixty-Fifth Regiment Illinois Infantry Volunteers, Known as the "Second Scotch Regiment" was organized at Camp Douglas, Chicago, Ill., in the spring of 1862, by Colonel Daniel Cameron, Jr., and mustered into United States' service May 1, 1862. The Regiment was ordered to Martinsburg, Va., and, on its arrival, was brigaded with the Hundred and Twenty-fifth New York and Batter M, Second Illinois Artillery, under command of Colonel Miles. When Colonel Miles surrendered at Harper's Ferry, the Sixy-fifth were made prisoners by the enemy. On the succeeding day, the Regiment was parroled and sent to Chicago, where it remained until April, 1863, when, being exchanged, moved April 19 and joined the Eastern Kentucky Army, serving in that campaign, and returning, via Cincinnati, to Camp Nelson, Ky., was sent to Knoxville, Tenn., under General Burnside, where it was assigned to Second Brigade, Third Division, Twenty-third Army Corps. Served during the campaigns in East Tennessee, taking part in the battles of November 28 and 29, in the defense of Knoxville. The enemy, under Longstreet was repulsed, with great loss. Shortly afterward, General Burnside was relieved by General Schofield. After a severe winter campaign, the Sixty-fifth re-enlisted, as a veteran organization, and went home on furlough, in March 1864, with over 400 men. When the veterans furlough had expired, the Regiment joined General Sherman's Army, 25 miles below Kingston, Ga. The Second Brigade was no composed of the Twenty-fourth Kentucky, One Hundred and Third Ohio, Sixty-fifth Indiana and Sixty-fifth Illinois, commanded by Colonel Cameron of the Sixty-fifth, General J.D. Cox commanding the Third Division. June 15, 1864, a general advance of Sherman's Army being made, the Sixty-fifth, on the right of the Twenty-third Corps, was brought into a sharp engagement with the enemy, between Kenesaw and Lost Mountains. The enemy fell back, and, on the following day, the Sixty-fifth Illinois occupied their works. Lively skirmishing was continued on the 17th 18th and 19th, and on the 20th, the advance was checked by a deep and almost impassable creek - the enemy disputing the passage of the only bridge with artillery and infantry. Volunteers being called for, about 50 men of the Sixty-fifth Illinois stepped forward and charged across the bridge, driving back the enemy, and holding the position until the remainder of the regiment crossed. During July and August, was engaged in numerous skirmishes. Some of them (as on July 19 and August 6) were quite severe. On the 18th August, Captain Duquid, with four companies, drove a superior force over two miles. August 26, with 15 days rations, engaged in the successful movement south of Atlanta, driving the enemy from Rough-and-Ready Status, and destroying the railroad; and thence to Jonesboro, participating in that battle. From thence moved to Decatur, and went into camp, September 9. October 5, marched in pursuit of Hood to Rome, Kingston, Rezaca, Altoona and Gaylesville, Ala. - back to Rome and Dalton, where it arrived, 129th. From Dalton moved by rail, to Nashville, November 7th. From Nashville, the Regiment moved to Pulaski, Tenn., and, on 22nd November was forced back to Columbia, by Hood. November 25 and 26, was severely engaged in Columbia, losing 3 officers and 50 men, killed and wounded. November 30, the "Scotch Regiment" was engaged at Franklin. More than 200 dead and wounded rebels covered the ground in font of the Sixty-fifth, and it captured the colors of the Fifteenth Mississippi Infantry. During the night, it fell back to Nashville. December 15 and 16, participated in the battle of Nashville, and afterward pursued the retreating enemy to Clifton, Tenn., where the Regiment remained until January 15, 1865. Moved, by boat, to Cincinnati; thence by rail, to Washington and Annapolis, and embarked February 2, for Wilmington, N.C. Landed at Federal Point, 7th, and was engaged in the heavy skirmishes there. 16th, crossed the Cape Fear River, and , 18th, flanked the enemy out of Fort Anderson. 20th, fought the enemy at Smithtown Creek, capturing 3 pieces of artillery and 350 men. February 23, Wilmington fell. March 6, 1865, broke camp, and moved to Kinston. From this place, the first five companies, except veterans, were sent to Chicago, under Captain Duquid for mustering-out. Marched to Goldsboro, N.C., and thence to Raleigh, where it remained until the surrender of Johnson's Army. From Raleigh the non-veterans moved to Greensboro, N.C. and went into permanent camp. May 1, four new companies of recruits joined the Regiment. In June, 4 officers and 250 men were assigned to the Regiment from the Ninety-second Illinois; 2 officers and 120 men from the One Hundred and Twelfth Illinois and 25 men from the One Hundred and Seventh Illinois. Lieutenant Colonel Stewart was mustered as Colonel. July 13, 1865, the Regiment was mustered out, and started home, arriving at Chicago, July 22, and received final payment and discharge July 26, 1865. May 31, 1865, According to orders from War Department, the veterans and recruits whose terms of service have not expired, Companies A, D, G, H and K, are consolidated under letter H. Companies C, E, F and I are consolidated under Letter K. Company B retains its original letter, and is filled to the maximum number with drafted men, assigned to the Regiment by the War Department. Last edited by Ben H. Phillips; Today at 02:05 AM. Good regiment, glad to serve under these nice guys. Good luck, from the 4th Rhode Island!